Public confidence in the Catholic Church has eroded considerably. There are several reasons for this, but one for which it has failed to take much responsibility is its failure in regard to Indigenous affairs. Not just the part it played in the Stolen Generations, but also its role in the destruction of Aboriginal cultural integrity and language. Present members of missionary orders, when writing up the story of their predecessors, tend to present these pioneer missionaries as enlightened men and women suffering hardship to spread the gospel. It is true, these men and women travelled into the unknown, poorly prepared, terribly equipped and unsuitably clothed — think of the nuns in their wimples and habits toiling under the sun — to share the story of the healer from Nazareth. And today there is a vibrant body of Australian Aboriginal Catholics who delight in the gift of the faith passed on. The destructive effect of the approaches taken by some missionaries does not negate the good work of many others. But it is part of the story and should be told. Dr Charles Duguid, who inspired the mission, told his missionaries to respect the local language and culture. According to the Australian Dictionary of Biography he said there should be 'no compulsion nor imposition of our way of life on the Aborigines, nor deliberate interference with tribal custom' and that the vernacular language should be used, medical care offered, and responsibility passed to the local people as soon as possible. He hoped the local people would see the gentle caring lives of the missionaries, recognise that their lives were based on the teachings of Jesus, and come to want to live like that. Ron Trudinger, a young teacher and linguist from Adelaide, having been able to learn the language and develop Pitjantjatjara orthography quite quickly, began to teach the children in Pitjantjatjara. Photos and films of these early days show groups of laughing, naked anangu children attending school and singing and writing in their own language. Over many years Duigud's message worked — anangu became Christians. Meanwhile the Missionaries of the Sacred Heart (MSCs) were conducting a mission in Alice Springs. The first missionary was Father Paddy Maloney MSC, assisted by a lay missionary named Frank McGarry. As a community worker he worked side by side with the Arrernte men as they strove to build a mission that came to be known as the Little Flower Mission in Charles Creek, a kilometre from the centre of Alice. McGarry's message to the Arrernte men was different from Duigud's. 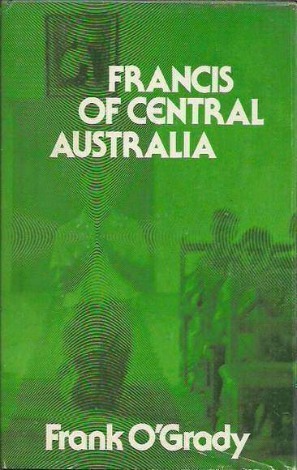 His story is recorded in the book Francis of Central Australia, by Frank O'Grady. O'Grady quotes McGarry ordering the children that they 'were not to speak Arunta [sic] in church or in school otherwise they would be sent home without tucker'. McGarry also sought to 'work quietly towards the elimination' of adherence to Arrernte cultural practices. Soon the Our Lady of the Sacred Heart (OLSH) sisters arrived. Their impact was powerful. They forbade the girls to speak Arrernte within the school or dormitory. I have heard many older Arrernte Catholic women attest to their pain at having their language drummed out of them in the name of the Church. The mission was moved to the abandoned gold mining centre at Arltunga 100km to the east of Alice during World War Two, then again to Santa Teresa (80km south-east of Alice Springs) in the early 1950s. It is today known as Ltyentye Apurte. It is a vibrant Catholic Community where until very recently the Marist brothers ran the Catholic School. The MSCs and OLSH sisters, suffering from a decline in numbers, have left the community. I worked with the Arrernte people of Charles Creek, where the first Little Flower Mission stood, in the 1990s and early 2000s. Many of the Arrernte children I taught at the Catholic high school in Alice Springs could not speak Arrernte and their understanding of Arrernte culture was deeply fractured. And of course they were in serious trouble with the 'whitefella' law. Although nominally Catholic, they had very little connection to the Church. Many missionaries tried to do better. Fr Tom Dixon MSC is famous for his intervention in the Rupert Max Stuart murder case, where his knowledge of English and Arrernte was crucial in confirming that the 'confession' signed by Stuart could not have been relied upon because it was written in a form of English that Stuart did not use. Fr David Reilly MSC used Arrernte as widely as he could in his relatively short ministry at Santa Teresa. In the 1990s Fr Pat Mullins SJ in Alice Springs sought to recite the Eucharistic Prayer at Masses with the Catholic Arrernte community in Arrernte, and all the hymns were in Arrernte. Today these skills and attitudes are again lost and the Mass for Arrernte is distinctly English. Today the clergy in Santa Teresa and Alice Springs are Divine Word Missionary priests recruited from a variety of overseas countries. These good-hearted men, coming from very different cultural heritages and having little understanding of the impact of settler colonialism on the Arrernte, have little appreciation of the struggle Arrernte have faced and make little effort to incorporate Arrernte language and cultural practices into liturgy. Whereas the Presbyterians valued and assisted the maintenance of Pitjantjatjara and did not seek to undermine anangu's practice of the tjukurpa, the Catholics in Central Australia often achieved quite the opposite. Today I received a Facebook message from a friend in Ernabella written in Pitjantjatjara and speaking both of her sadness at being in 'sorry camp' and of being consoled by her faith in her Christian God. Alice Springs Catholic Arrernte want the same experience but find themselves blocked to achieve it. In Alice Springs the Ngkarte Mikwekenhe Community (NMC) (Mother of God community), largely the product of a symbiotic relationship between several local Arrernte women and Catholic religious, still does not have a viable centre. And in 2012, Irrkerlantye Learning Centre, a Catholic Arrernte education centre, was closed. It is time for the Catholic Diocese of the Northern Territory to truly take on the 'mission' to the Arrernte, which might entail an apology, a rewriting of the history, a renewed effort to get the message right including placing Arrernte language at the core of practice, and significant financial inputs into the building of new worship and education centres, with a view to handing responsibility for them to the local Catholic Arrernte elders. When you have a lot to answer for you are left with a lot to do. Mike Bowden has a Master of Aboriginal Education at Northern Territory University. 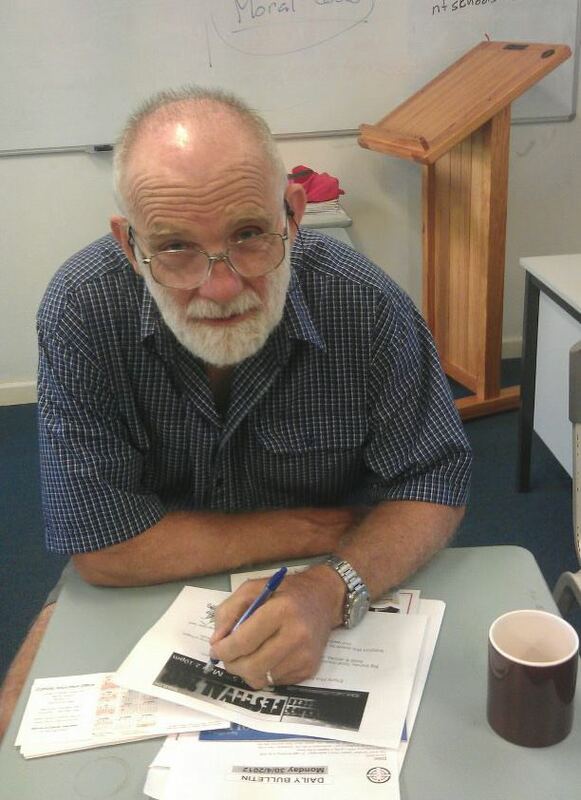 He was founding coordinator of the Ntyarlke Unit at the Catholic high school in Alice Springs in 1988. From 1993 to 2001 he was manager of community development at Tangentyere Council. In 2005 and 2006 he was acting principal at Ngukurr School and Minyerri School in the Roper River district of the Top End. I don't agree with the suppression of any language. But I dispute the notion which may be lurking here (apologies if not) that another, non-vernacular, language can't be added and that it can't be used for worship. For one thing, many aboriginal tribes and other ancient peoples had their own hieratic languages, used in sacred ceremonies, which were not understood even by those deploying them in rituals. This is an anthropological constant: as long as "the gods" understand it, that suffices. (See Christine Mohrmann, "Liturgical Latin: Its Origins and Character" 1957.) For another, the Australian aborigines were easily able to use Latin and became quite attached to it. There's a famous interview of an aboriginal woman elder by Paul Collins on an ABC documentary about 15 or more years back wherein he puts it to her (paraphrasing) "You've seen many changes in the church over your life" and she answers "Yes. They took away the Latin. We'll never forgive them for that." To back that up, here's a recollection for Fr Peter Hearn MSC: "At the funeral Mass of Bishop O’Loughlin in 1985, the Tiwi singers began the traditional chant from the old Latin Mass for the Dead, the Dies Irae. It was unscripted, not in the official booklet. The assembled bishops and clergy and religious took up the singing with them. It is a long chant, and one by one the bishops and others began to drop out of the singing as memories failed. But not the Tiwis—they sang it to the very end." (Peter Hearn MSC, "Comment on the Gsell Lecture" Compass, http://compassreview.org/summer06/6.html). So yes, by all means bring back Arrernte. But why not the Latin, too? The Roman Catholic Church treated indigenous Mexican cultures the same way. You are all wrong, religion has never been a part of Aboriginal culture, and in Australia as in New Guinea religion has caused families and brothers to fight and causes division, The New Guinea Government thru Somarie gave them the mix of religions an ultimatum, join together and form one religion or get out of the country .For the genuine religious orders here should do the same, form one church but leave the culture and the language alone , The Catholic Church is possibly the most destructive church in Australia although some of its many members do have some practical sense and commitment to our people and to many are the total opposite taking and using our people as children for their own political and in some cases sexual purposes.As for Brithish and Australian Laws, why are our people outnumbering by 5 to 1 the prison population in this country, from Alcahol and white mans influances , Australians complain about the boat people we had the same problem a couple of hundred years ago. Thanks for this Mike. This is the sort of stuff that should be on the agenda at the Australian Catholic Bishops Conference, History is written by the victors and Church History is often written from the sacristry.I hope this begins a vigourous discussion here and some good shared wisdom. I hope we get the voices and experience of Indigenoous People in this forum. I have forwarded this to our Murri Ministry team in Brisbane who are involved in some creative models of cross cultural rituals for sacraments. Thank you for these words of wisdom Mike. There still needs to be a big shift in our european Catholic culture from colonial to post colonial thinking perhaps. Missions were political outposts, integral to colonial expansion and with "God,king and country" all pledged allegiance. I am ashamed of the 'Australian'Catholic church history,its inherent european culture a powerful tool for colonialism being not of British but Italian,Portuguese,Spanish,French,German origins etc..The church was in the race to acquire land and dominion over indigenous people. Today it enjoys a prestigious reign over much of the poorest places in the world, espousing the highest morals with its inestimable wealth and power and real arrogance and ignorance,lack of understanding and denials of responsibility.Today these people are still overwhelmingly economically disadvantaged ( worse than before invasion). Bishops are pawns; they have little internal influence it seems and not acted strongly enough to end neglect and abuse of children, disabled, marginalised and poorest people.There is no equality in a pyramid shaped institution.The grass roots of this church are its foundation and where Christ lived. The church must realise it is part of the problem and use a vast wealth to end poverty,set people free, return possessions and assist people regain their autonomy. Without basic RESPECT for language and culture there is no equality,no true independence and .The Austalian 'chapter' of church history will be seen as a remains of european vestige and as it pledges allegiance to Rome and disguises its lack of focus on Austalian urgent christian social justice issues. The Christian message is not about control, rather responding with love to spiritual and human needs. Church leaders espouse these values yet actions remain blatantly obvious:NOT SORRY. A real social justice issue for the people in central Australia. Ignorance of a people and a culture is paramount here. Thank you for the article - its message is better than most on this important topic because of its honesty. It is so hard to forgive properly and therefore apologise properly seems to me but the Catholic Church needs to do this. Thank you also for the reminder of the brave role of Tom Dixon. Alfred, I am deeply sorry, deeply ashamed. Its long past time we, the european invaders, accepted the historical consequences of colonial attitudes, practices.We have decimated lives and cultures and continue to seize control or turn our backs in the name of freedom.Our treatment of asylum seekers,refugees, reflects our greed and brutal sense of entitlement.Who are the noble savages now? The church cannot have it both ways; protection and sanction of its OWN interests while declaring justice and human rights for all from afar. This is the root of injustice and yet Christ gave us the way to live and heal wounds of the past, heal ourselves. The church, as it proclaims to be christian, must by definition,use its priviledge and wealth to reverse the past, be truthful and ask for forgiveness, return the rights of powerless and then speak of sins being absolved. Otherwise the church has merely replaced the ancient Roman power structures with its own empire.Sadly, human rights are not protected in wealthy democracies and it is still the wealthy who enjoy the spoils of past and present atrocities (sins). Yes, you are so right Mike. I was recently in Alice Springs and at the church. I was greatly disappointed that there was no reflection of the Aboriginal culture that was solidly interwoven through everything. Masses are held for Aboriginal Catholics separately. If I had been able to stay longer, i would have loved to connect with them and pray as a body. Language is central to thought, to undestanding relationships, to expressinig and teaching culture, and to knowing who you are - and also central to the process of dispossession. I am so sad to hear that the good work being done is now once again being undone. thank you for speaking out. I do hope that it will start a new conversation, and thence practice. Thank you Mike for writing on this topic. It needs to be said publicly. How would we like it happening to us? My experience with aboriginal is humbling.Some do not even speak their clan's tongue. Some years ago I was given a tour of an impressive Aboriginal cultural centre just north of Cairns. The last thing I did was watch a document-ary on the tribal life of the local Aborigines. They had an idyllic life living off the land and practising their own culture and religion. Then came the Europeans! The documentary showed these lovely free and easy people imprisoned, enslaved and slaughtered. When I walked out I was in shock at the brutality and I said to the elder who had been showing me around that I was shocked and disgusted. We were walking down a passageway which led to the exit. Suddenly he stopped and put his hand firmly on my shoulder and and said, "John, Turn around. "You see that line you crossed as we came out here. What you saw happened on the other side of that line. What happened to my people a couple of hundred years is over. The people who committed those atrocities are dead and gone. There is nothing we can do about that. "Turn around John." As we faced the exit he said, "I'm not staying back there. I'm going that way into the new world whatever it may bring. Our children are getting educated. They come down here from the Atherton wanting to work here. I tell them to go back to school and get their senior. Better still go to university, to stop nursing resentments and get on with it." As one who worked at Ernabella for several years under the polices espoused by Charles Duguid, I was interested to read Mike's comments. While the Catholic Church, as you suggest, has cause to repent and make restitution in response to past shortcomings in this field, even a Protestant like myself must acknowledge that individual Catholic missionaries made significant contributions. Following my time at Ernabella, I lectured in Aboriginal Studies in Adelaide at a time when we were the only institution offering external courses in Aboriginal studies. As I marked assignments from Catholic sisters who were relating to Aboriginal people in remote parts of the Kimberleys and in Redfern, I was impressed by their sacrifice, dedication and empathy. They may not have been ordained to administer the sacraments, but I gained the impression that as they sat around the campfire drinking tea from the billycan, the Catholic Sisters and their indigenous sisters were experiencing the real presence of Christ. Tjampunya. Thanks for alerting us to the situation as you understand it in Central Australia. I'm not qualified to comment on that but i do wish to make some comments concerning the situation in the Kimberley. I arrived in Broome in 1972 with two other Christian Brothers built on the fine work of the Sisters of St John of God in establishing Nulungu College. In those early time I liaised with Paddy Roe and Butcher Joe, both Nyikina elders to introduce our students to Butcher Joe's beautiful creations. One of those dancers was Philip Roe an outstanding leader against the setting up of the gas hub at Price's point today. In fact many of today's Aboriginal leaders are products of Nulungu College. Once we began accepting Secondary students we ensured that Sunday was their day to engage in traditional hunting and food-gathering while we were the leaders. We also coopted the priest-linguists like Frs Kevin McKelson and Anton Piele to help the students become fluent writers in their own languages. In those times there were thirteen languages represented in the school. I myself gained some facility with Kukuja the lingua farnca in the East Kimberley. With the organisation of the CEO this attention to language and culture was reinforced as was due attention to English as a second language or dialect. But one has to also recognise that Aboriginal cultures can be both localised and adaptive hence the wonder ful work done by Jimmy Chi and the Pigram Brothers in producing the great musicals Bran Nue Dae and Corrugation Road. And don't forget the almighty speech on the lips of Pope John Paul ll. Vatican ll was the watershed between assimilation and cultural recognition. I'm glad I was in era of the latter. The current Principal at SantaTeresa is Brother Daniel Hollamby (Marist). Well said Mike and very reflective of your immense contribution and humilty. There is a recent PhD thesis on Charles Duguid; I am sure Google would find it. His books are now out of print but can be obtained from booksellers who specialise in such things. I remember Dr. Duguid well & am still in contact with his son Andrew. His daughter lives in Canberra. Dr. Duguid is one of our forgotten heroes. Though I simply had brief 'locum tenens' stints in Tennant Creek church and Alice Springs, I recall outstanding MSC missionaries: Fr Vin Bailey MSC who taught us first year minor seminarians Latin,[and showed us his well parched thick inked, self composed dictionary of English to Aboriginal], We 14year olds were intrigued to see among the "a"s his translation of 'a-se'; He showed local Santa Teresans how to make bricks and build houses. I lived in community with several NT retired aging missionaries, Fr Frank Flynn MSC [ophthalmic mentor of Fred Hollows] and Father John McGrath MSC:” During the Bombing of Darwin the first wave of 188 Japanese planes was spotted by Father John McGrath, a Catholic priest conducting missionary work on Bathurst Island. Father McGrath sent a message on the radio saying "An unusually large air formation bearing down on us from the northwest". Nearly everyone ignored this, though it was on the most popular radio station. About an hour later there were roughly 100 people dead, but the people who followed his instruction were all okay”. [Wiki] I salute them along with many others even if not awarded the '2013 Acculturation Award, but [pace Fr Flynn] many regained vision and much more importantly, many souls were saved! Rev Shortell, the history of the RCC in Mexico is long and complex belying facile reductionisms [tragedies and benefits]. How about a 'Mexican sorry day' for the Cristeros insurrection? "The effects of the war on the Church were profound. Between 1926 and 1934, over 3,000 priests were exiled or assassinated. Where there were 4,500 priests serving the people before the rebellion, in 1934, there were only 334 priests licensed by the government to serve 15 million people, the rest having been eliminated by emigration, expulsion, and assassination. The persecution was such that by 1935, 17 states were left with no priests at all. In an effort to prove that "God would not defend the Church", Calles ordered "hideous desecration of churches ... there were parodies of (church) services, nuns were raped and any priests captured ... were shot ...". Calles presidential period ended and despite the persecution, the Church in Mexico continued to grow. A 2000 census reported that 88 percent of Mexicans identify as Catholic. "[wiki] Talking historical nuance eg re accultruration: New Catholic Encyclopaedia  noted re Mexican RC evangelisation: "Some missionaries thought they saw in native rites or images vestiges of remote Christian teachings, an ingenious misinterpretation that many were to follow two centuries later." More Frank McGarry "story that should be told": "Responding to a suggestion by Monsignor F. X. Gsell, McGarry ,Frank McGarry went to Alice Springs, Northern Territory, in 1935 to assist Father P. J. Moloney in establishing a mission to the Aborigines. The Little Flower Mission, on the outskirts of the town, commenced on 3 October. At first McGarry fed, clothed and taught Aboriginal children at the presbytery and in the local church. After a site for a permanent mission was selected about half a mile (0.8 km) to the north, a well was sunk, a windmill, tank and church-school were erected, and wurlies were built to accommodate families. McGarry travelled to Sydney and arranged for the Daughters of Our Lady of the Sacred Heart to teach at the school. He obtained most of the mission's food by begging or bargaining in the town. In the early years he acquired clothing from his relations, from the Society of St Vincent de Paul and from the proceeds of the sale of Aboriginal artefacts and weapons. "[Australian Dictionary of Biography]. Mike, I appreciate your view from where you sit. Can we accurately establish if we are in fact forcing Australians to hold onto a language that they themselves are not terribly fussed on keeping. I think this needs to be a choice, a freedom for the current and next generations. Students want to make their own choices these days. In early-childhood learning I can understand a strong connection for the people in the Diocese of the N.T. being an option. I can't see any harm in schools learning Arrernte nationwide for that matter, we are one family. I think you need to have been there yourself during these times to be sure , truly sure about arriving at some of your strong points of view. I was born in Darwin and my parents knew Bishop O'Loughlin,and personally witnessed the era. I think apologies from the Catholic Church on this one is a little wasted. Put it to better press and incorporate Aboriginal studies and Languages in all schools. We can say we are sorry forever and young aboriginals may simply want to do French and German. I much prefer Latin to be compulsory in Catholic Schools than Italian. Cheers ! The fact is, the early missionaries at Ernabella (and Ntaria) exploited the language, especially through music. Traditional music was characterized by cascade and droning with verses petering out at the end of the cascade. Along came the missionaries with a fascinating new musical structure. This involved a time signature - a different metre - and harmony! 3rds, 4ths, 5ths and 6ths. Anangu regarded this new form as very 'flash' and to learn to sing this way was undertaken with a great fervour. It was regarded as 'iyani iyani' which means 'ingenious'. Missionaries exploited this; they learnt the language and wrote the songs. Anangu learnt them off by heart and the message was forever stuck in their heads - that is the power of the musical hook. My missionary was better than your missionary? So what? Today's 'missionary' communities on APY lands are characterized by violence, drugs, gambling, alcoholism, fragmented relations, welfare dependance, greed and a debilitating widespread lethargy. A plethora of aboriginal organizations, NGOs and government agencies run about trying mend, fix and piug holes. Anangu call themselves 'Christian' like they barrack for a footy team. Where are the missionaries now? My observations show that the most destructive force on this planet is religion. All brands. My heart bleeds at the mention of bringing religion to the ¨heathens¨ as I know just how much suffering the church will cause.